Utter the phrase "Internal Revenue Service," and most people will conjure up visions of painful tax audits, stacks of paperwork or confusing accounting jargon. But today's IRS is a different kind of government department, one that's committed to high-quality service at its almost innumerable customer touch points. With clearer tax forms, a spirit of openness and a remarkably well thought-out and customer-centric Web site (www.irs.gov ), the IRS has indeed come a long way. 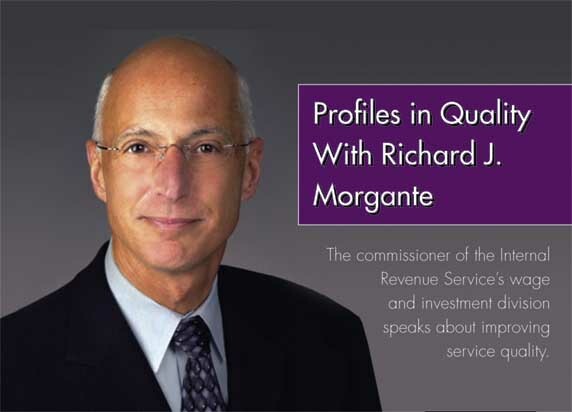 Richard J. Morgante is the commissioner of the IRS' wage and investment division, which helps educate and assist customers in understanding and satisfying their tax responsibilities. The division's specific strategic priorities include meeting the needs of taxpayers, broadening the use of electronic interactions, addressing key areas of noncompliance, stabilizing traditional compliance activities, and providing high-quality, efficient, responsive information and shared support services. In this far-ranging conversation, Morgante reveals how, why and when the IRS began using lean Six Sigma; the importance of benchmarking to the organization; the role of training; and how the department built its Web site with an eye on the most important metric of all, customer requirements. Quality Digest: How did the IRS develop its quality assurance program? Richard Morgante: The main impetus for our current quality assurance program was the IRS Restructuring and Reform Act of 1998. This act from Congress directed the IRS to become more customer-centric, more accountable for our actions and better at measuring performance. With the mandate that we had from the act, we set forth on a course to achieve three main objectives. The first was to create a common set of measures to provide visibility across all of our operating systems. Our main focus here was what is important to the customer. With that, we really focus on three things: accuracy, timeliness and professionalism. The second key objective was to create a line of sight into accountability for our measures. Measures that we use at the corporate level can be drilled down to the site level--such as the toll-free answering site--as well as the individual employee level. This accountability enables us to identify the source of problems rather than just what needs to be fixed. Our third key objective was to make quality improvement a strategic activity where we focus on areas of importance to the taxpayers. For example, when taxpayers ask us a question, they expect a correct answer. That becomes a very important measure for us. We measure individual employees to make sure that they are giving accurate answers because that's the customer's expectation. QD: When was Six Sigma introduced into the organization? RM: First, just to give you some perspective on our division, we have, at peak, with all of our seasonals on board, over 50,000 employees deployed across the country. We have 25 call-answering sites, eight submission-processing sites to process the returns and 400 walk-in offices across the country. We also have an educational outreach program for taxpayers around the country. Six Sigma was formally deployed within the wage and investment division starting in 2005, but we were actually using the tools and methods as early as 2001. That's when we started using Six Sigma to improve the quality of our toll-free telephone service. For the past five years, we've trained over 200 Green Belts who have applied those skills in project teams or as analysts that work in our embedded quality measurement systems. We used a grass-roots approach to introduce Six Sigma within wage and investment. We quietly built success stories over those years, and then took the methods of those successes and deployed them to the other sites across the country. We believe this approach gained us some cultural acceptance for the formal launch of the program that really began in 2005. QD: What sort of benchmarking metric does the IRS use to ensure continuous improvement? RM: For services that are comparable to commercial organizations, such as our toll-free call centers, we use metrics that can be compared to other large call-center operations--level of service, operator availability and average handle time. In the case of our call centers, we maintained a high level of quality, which is over 90 percent, while still managing to maintain the level of service goals we set. That's a scenario where we have an activity like our call centers that are comparable to a commercial organization. Unfortunately, many of our processes have little direct comparison to outside organizations or the private sector, so in those cases, we benchmark against ourselves from year to year and we set stretch goals to try to become more efficient and effective. QD: Can you give us an example of one of your stretch goals? RM: Sure. Refund timeliness is something that we measure; an individual taxpayer submits a return and we have to provide a refund within a certain window of time. We measure the timeliness of that refund. What we do is try to increase and push people from year to year to become better and faster in getting refunds out to taxpayers. We push them to demonstrate continuous improvement in those processes. QD: How do you do that? RM: Every year we set targets for the following two years, so we know what we want to accomplish. For instance, right now in fiscal year 2006, we have set targets for both 2007 and 2008. Next year, we will reevaluate the 2008 targets and then set 2009 goals, but we look at what our performance is right now and use customer feedback to see if those are meeting customer expectations. QD: What sort of training do you make available for your employees? RM: What we're learning how to do comes through reapplication of these embedded quality concepts across the organization. We don't really emphasize quality improvement training as a necessary activity for all employees. Instead, we train those individuals who can immediately apply the learning to the work they have and thereby improve their individual work, no matter the process. QD: So you're learning as you go and applying those lessons going forward. RM: Right. Let me give you an example. In our toll-free service, we analyze a statistically valid sample of calls. Managers listen to the calls, and they rate them according to a number of attributes we are trying to improve. We then sit down with the employee and review the rating, asking the following questions: "Did you identify yourself?" "Did you give out your employee identification number?" "Did you use sufficient probes to understand the question that the customer was asking?" "Did you give a correct answer?" "Were you professional in your tone?" "Did you make sure you fully answered the question before disconnecting the call?" Through that process, which is part of our embedded quality process, we feel that we're driving improvement employee by employee. QD: What steps did the leadership of the IRS take to ensure that the Internet systems were of high quality for users? RM: We're very proud of our Web site. We put a lot of effort into it; www.irs.gov is constantly being assessed to ensure that it's meeting taxpayer needs and expectations. We use a variety of tools and measures to learn how taxpayers use this site so we can gauge its effectiveness and identify areas for improvement. First of all, we use the American Customer Satisfaction Index, which is a standard measurement tool conducted by the University of Michigan to measure customer satisfaction for both federal and industry sites. Eight elements of the Web site are surveyed and factored into consolidated satisfaction scores. We use ACSI as a tool to target the lowest-scoring elements for improvement. After making some changes to the site, our ACSI score has jumped dramatically, placing www .irs.gov among the top sites both public and private. Next is www.keynote.com , which is an industry Web site performance- measuring service. We use this to indicate response time and availability for taxpayers accessing our site--in other words, how quickly information is returned once a link is selected. Our site is consistently ranked first or second in response time. The third tool I'll mention is www.foreseeresults.com. This site surveys customers regarding the usefulness of the information, products and services on www.irs.gov. It also analyzes behavior such as referring the site to others, using it as a primary business tool or the usefulness of new ads on our home page. We get a variety of useful insights as to how taxpayers are using this site and how it's working. We also put our Web site through extensive usability testing using a lab that we have in Ogden, Utah, or using a new Internet-based usability tool that we helped develop with the General Services Administration. Usability testing enables us to create scenarios and then watch taxpayers follow the scenarios to see how they navigate this site and what problems they encounter. Through that, we learn what worked well for them. QD: What future actions can consumers expect the IRS to take to ensure and expand quality? RM: Our lean Six Sigma program has a tremendous amount of potential as it becomes part of the culture of the organization. We actually started very deliberately and then targeted our efforts to make sure that we were successful. We started with a grass-roots approach to gain acceptance within the organization. By that I mean that we started with a variety of projects where we had success and were able to take that success and deploy it to the other sites through the organization. Our expectation is that we'll gradually expand the resources to embed lean Six Sigma deeper into the organization, producing a return on investment that justifies the increase in resources. We have within the wage and investment division a modernization council that comprises all the senior leaders from all the operations within the division. This council is now selecting the lean Six Sigma projects that we're deploying in the organization. They are monitoring those projects to ensure that they yield the results that we intended and that they will sustain the projects and lean Six Sigma over time. So in the long term, our strategy calls for us to move beyond incremental process improvements to one where processes are actually designed and optimized from the start with the taxpayer in mind. We're going to use the best practices from many of our lean Six Sigma projects to transfer innovations to other parts of our enterprise, and we're looking to partner with other parts of the IRS to expand those improvements beyond our division and hopefully, as we go on, to other parts of the government. Nicolette Dalpino is a freelance writer and editor specializing in government and international travel.